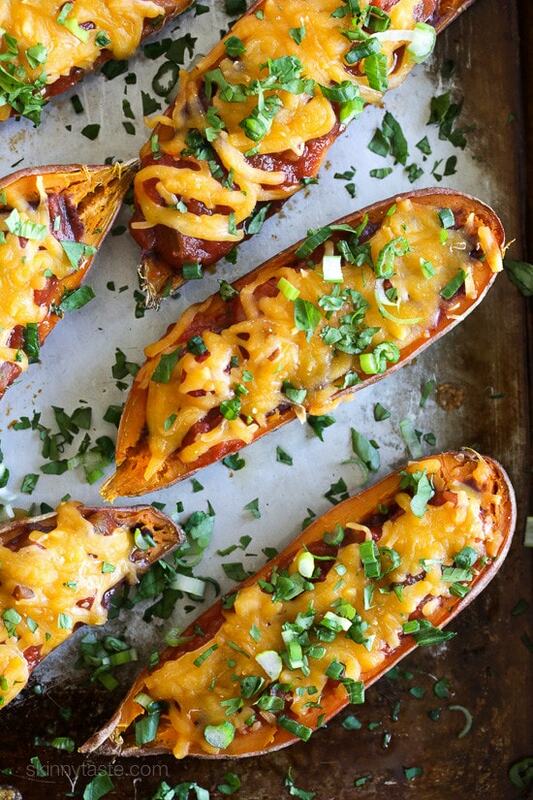 These cheesy baked sweet potato skins are loaded with fat free black refried beans, salsa and cheddar cheese. 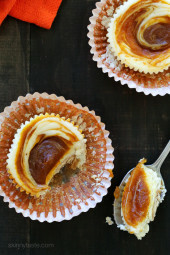 This easy sweet potato recipe needs just a few ingredients but it tastes SO good! Baked Sweet Potato Skins are a healthy alternative to potato skins, perfect appetizer whether you’re watching the Super bowl or getting together with friends. 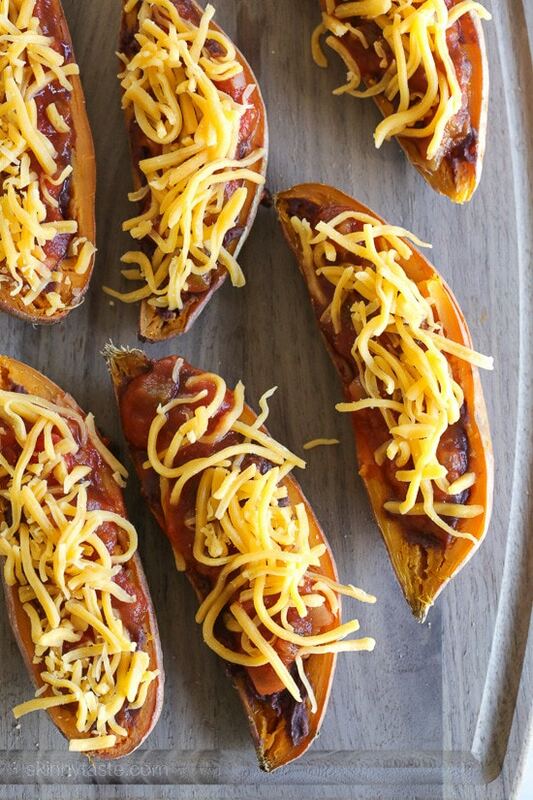 So quick and easy to make, a few of my other favorite baked potato recipes are Italian-Style Stuffed Sweet Potatoes, Sloppy Joe Baked Sweet Potatoes, and Mexican- Style Loaded Sweet Potato. This potato skins recipe vegetarian and naturally gluten-free for those of you with dietary restrictions. To find smaller sweet potatoes like the ones used here, it’s best to buy them in a bag which usually come smaller than the ones sold single. What to do with the scooped out potato? Scooped sweet potato can be stored in an airtight container for 2-3 days. I like to mix it with just a smidge of butter, low-fat milk, salt and pepper and serve it alongside chicken breast. 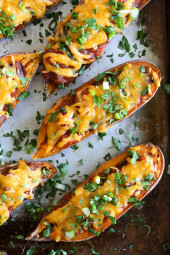 These cheesy baked sweet potato skins are loaded with fat free black refried beans, salsa and cheddar cheese. Just a few ingredients but they taste SO good! Preheat oven to 400 degrees F. Adjust oven rack to center of oven. Place whole sweet potatoes on a sheet pan covered in foil or parchment, poke each a few times with a fork. Bake until fork tender, 40-45 minutes. Allow to cool for 10 minutes. Switch oven from bake to broil. Meanwhile in a small bowl combine black beans with taco seasoning. Place potatoes, skin side up back on the sheet pan, spray with olive oil, top with pinch salt and pepper, and broil for 2 to 3 minutes. Remove skins from oven, turn over and fill each with black beans, 1 tbsp salsa and 1 tbsp cheese then return to oven to broil 2 minutes more. Top with each skin with scallions and cilantro and eat right away. * Weight of each skin after the potato is scooped out is about 1 1/2 ounces each. Sounds like a lot of sodium?wondering how much. or two tbps of sour cream?? That would vary and depend on the type used. You would be better off to check the container for serving size and nutritional info. Looks awesome! Do you think that it would be okay to use fake cheese to make them dairy-free as well? 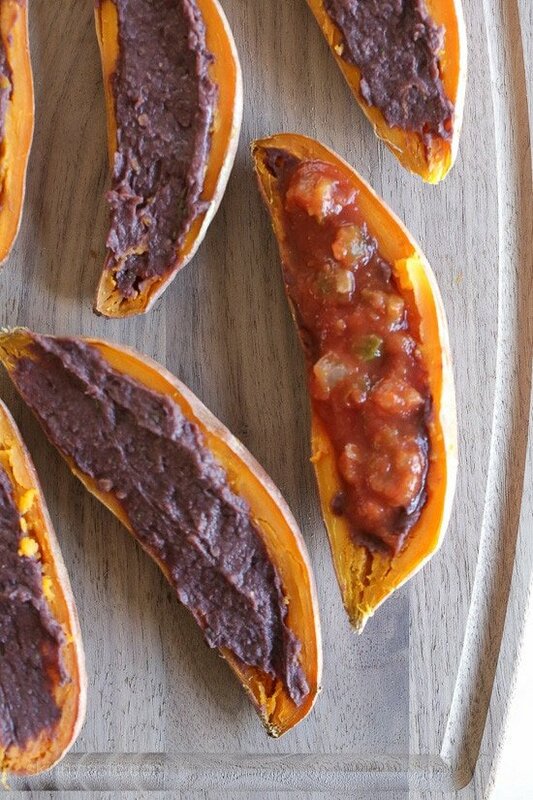 I've never thought about stuffing sweet potatoes with refried black beans. I love everything about this recipe except the soap *cough* *eh-hem* I mean… cilantro. Huge favorite at our house (for Superbowl Sunday). We actually mixed the removed sweet potato in with the black beans and used the combo for the filling. Excellent! We will be making this one a lot! Yum, what a creative combo – love! Do you eat the whole thing? Or just the filling? I was wondering the same. If they're easy to peel … Yes. If skin stays on then I guess I'll serve them with a spoon. Scrub the skins and rinse them off, then eat the whole thing! Sweet potato skins taste good. Sometimes if they have long tough ends I will trim those off, but you can definitely eat the sling after cooking. Oh yeah. Eat the entire thing. Be sure to crisp up the skins in the broiler before you fill them. I broiled the skin side up longer the recipe to get them nice and crispy. Delicious!! These look amazing! Thank you for sharing! Yum! 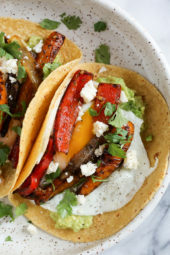 They look great… What could you substitute for refried bean?? I really don't like beans at all. These look awesome. I love when normally unhealthy recipes are made healthy…and vegetarian! These would make a great meal or appetizer! I love how healthy they are while still looking really tasty. Trader Joe's carries refried black beans. Whole Foods carries them. They're organic and in a bpa free can for $1.39 each. I am obsessed with sweet potato everything! 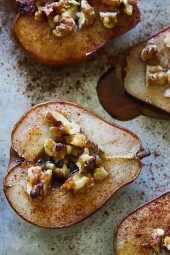 Love the idea of feeling indulgent on super bowl sunday, while staying healthy! What is the difference between Kosher salt and regular salt? These look amazing!! Salts vary in grain size,kosher salt is a larger grain than table salt. So… a tsp of table salt is more salt than a tsp of kosher salt. If you only have table salt I would just use a little less than than the recipe calls for. Retried beans on potato skins?! If anyone else suggested this, I would say they were crazy! But your recipes have never let me down and are always so delicious, that I have to give it a try!